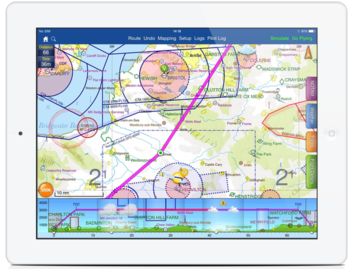 The flight planning features in SkyDemon are all designed to make planning a flight less tedious and more interesting, by bringing the very best aeronautical briefing information directly to your fingertips in real time as you explore our charts and experiment with potential journeys. SkyDemon will help give you the confidence to fly further and to more interesting places. Plan a journey, brief yourself on potential hazards, prepare for flight and analyse your track logs. Live briefing data includes NOTAM, airfield documents and maps, TAF, METAR and wind forecasts at altitude. Read more about SkyDemon's flight-planning features below, or simply start using SkyDemon today. Our charts are widely recognised as being the clearest aeronautical charts available. They are entirely bespoke, created by us every 28 days (at least) directly from raw aeronautical data published by the countries we cover. This means that wherever you fly, the look and feel of your chart is consistent. Comprised of many individually selectable layers and adjustable to your preferences, they show you only what you need to see and nothing else. Unlike printed charts, a SkyDemon chart is aware of your plans and can dynamically hide airspace and other features not relevant at the levels you are flying. This makes it much easier to interpret, and as a result, safer. There is a high level of interactivity in our charts. Many details which might in the past have been written permanently on your map are now completely hidden until asked for, by simply moving the mouse or touching with your finger. Practically every charted item can reveal extra information, whether it's the vertical boundaries or activity times of airspace, the frequencies for an airfield or the height of a ground-based obstruction. Best of all, because our charts are created and owned by us, they are all included as part of your subscription. We have charting for all of Europe, southern Africa, and the USA. Planning a route with SkyDemon is as simple as clicking on, or touching, consecutive waypoints on the map. This intuitive method of route planning was pioneered by SkyDemon and is one of the hallmarks of our software's simplicity of use. Once configured, the route can easily be adjusted by dragging legs to create diversions. In this way you may find yourself planning many fantasy flights of the future. As you plan, SkyDemon obtains all the briefing information necessary for your flight in real time (more about that below) so that accurate readings of total distance and time are always available. Some of this information is used to create the Pilot Log, which you can view or print at any time and includes essential information like which headings to fly and your minimum safe altitudes. It also includes enroute frequencies and radio navigation aids you are likely to use. You will see warnings displayed in real time as you plan. Warnings include penetration of controlled or dangerous airspace, a temporary restricted area created by NOTAM, and planning to fly a leg lower than is safe. As with our charts, the types of warnings shown are configurable to your own preferences. Invented by us, Virtual Radar supplements the way you visualise a route you are planning by adding a new dimension of output, and is an essential companion to the main chart. It shows a side-on view of your route as if it had been straightened out, so you can relate each leg to nearby terrain, airspace, obstacles and other features of interest. At a glance you can tell what sort of adverse (or beneficial) weather conditions are likely to affect you. SkyDemon has been built around the NOTAM system from the outset, and nobody does NOTAM better than we do. We work closely with Eurocontrol to ensure our subscribers have access to the very latest aeronautical bulletins for every country in Europe and beyond. 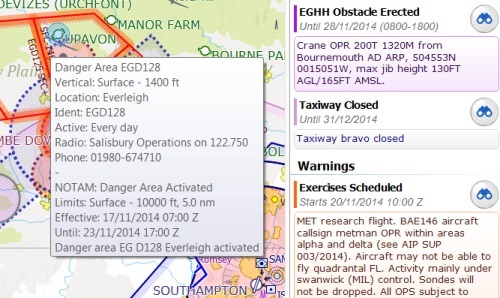 While planning a route you will see a NOTAM briefing updated in real time. This is the safest possible way to brief yourself as it dynamically selects only those bulletins relevant to the journey you are planning. They are colour-coded, easy to interpret and you can even hide those you deem irrelevant, so they will not appear in future briefings. With the inception of SkyDemon we invented technology that enabled us to graphically embed NOTAM into the main map, leading to greatly enhanced awareness of how a temporary notified situation could affect a potential flight. We have continued to develop this technology and our NOTAM depiction is now even better, allowing us fine control over the depiction of the most intricate of restrictions. SkyDemon downloads and combines TAF, METAR and winds aloft forecasts in order to bring you the very best aviation-specific weather information. 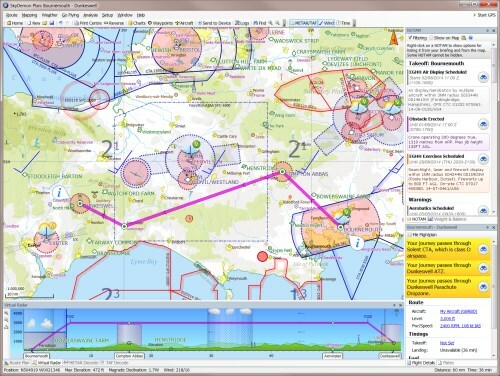 You will see the weather conditions within your chart as you plan: all airfields near your route will be annotated with simple colours indicating good VMC, marginal VMC or instrument conditions as defined according to your own levels of comfort. TAF and METAR are decoded for convenience, and can be subscribed to for any airfield in the charts you have installed. A wide area overview can also be requested for an entire country, giving an instant picture of the best places to fly. The Virtual Radar view of your flight will show weather conditions in detail, right down to individual cloud layers and any precipitation coming from them. Forecast winds aloft are integral to the calculations SkyDemon performs to give you the correct headings to fly and an accurate prediction of fuel consumption. You can even perform a wind analysis, which models your planned flight at all altitudes and reports the most optimal level at which to fly. We also include GAFOR route forecasts in Europe, where available. 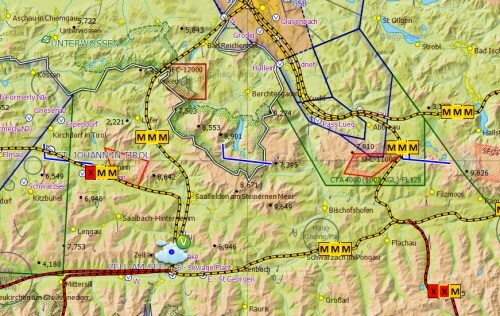 These display forecasts for entire routes through mountainous terrain and are essential for mountain flying. With all SkyDemon weather, you can intuitively slide forwards and backwards in time to switch between observations and forecasts, and see how the conditions develop. SkyDemon lists all available documentation for airfields involved in your route as you plan. You can download and view a document from our library with one touch, and the document is then cached for subsequent offline retrieval. We license all European national AIPs for inclusion in our library as a standard part of all subscriptions, and there are many popular third-party publications containing a wealth of local knowledge available as optional extras. Many countries publish detailed visual approach charts and runway/taxiway diagrams for airfields as a standard part of their AIP. Most of these are georeferenced by us so they can be seamlessly embedded inside the SkyDemon enroute chart, giving the maximum amount of local detail. With SkyDemon you can say goodbye to much of the paperwork associated with flying, from weight and balance calculations to flightplan forms. Every flight you plan is modelled in real time, taking into account the performance characteristics of your individual aircraft and the precise weather conditions for the time of the flight. This yields fuel consumption figures far more accurate than a quick paper-based calculation and a realistic idea of exactly how long a flight will take (and how much it will cost). 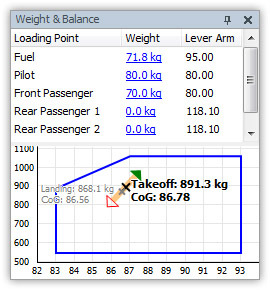 The various loading points in your aircraft will be defined when you first start using SkyDemon, so for any flight you simple enter the weights of your passengers and luggage, and the software will automatically fill in the weight of the fuel you have elected to carry. A quick reading of the total weight of the aircraft and its centre of gravity, and whether those figures fall within the acceptable loading envelope, are only a glance away. SkyDemon can produce an ICAO flightplan with almost every field filled in automatically from your route and aircraft profile. We have partnered with EuroFPL to deliver instant filing of flightplans from within our software. Using a modern, internet-connected mobile device, you can even file your flightplan from your cockpit. When arriving in or departing from the UK mainland, sometimes a UK GAR (General Aviation Report) form is required. SkyDemon will let you know when this is the case and will facilitate the instant online filing of this information for no extra charge, for most light VFR flights.